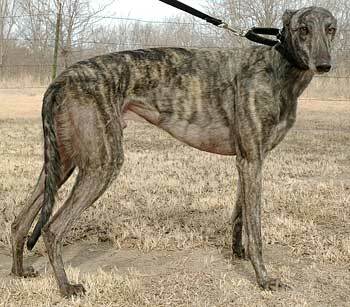 Tommy, aka Ale Minaki Tom, is a handsome dark brindle male born June 27, 2003. An offspring of sire, Minaki Zeke, and dam, Iruska Daisy, Tommy competed at the Dairyland track in Wisconsin, retiring after 17 races. With lots of love to give his new family, Tommy is ready for a home to call his own. Tommy is not cat tolerant. Since arriving only a few days ago we have found that Tommy is a very loving and somewhat shy boy. His shyness is exhibited in his submissive personality, but in time we are sure he will relax and learn the joys of retired life. He is eager to please and enjoys being petted for reassurance. He often expresses himself through his signature smile by grinning at you when he is happy. 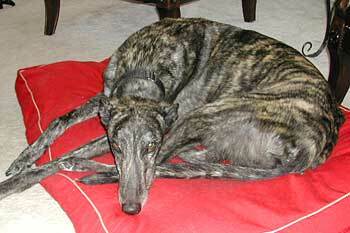 He is a typical greyhound that loves to sleep on his padded bed and enjoys being near you during his naptime. During the day Tommy is content to rest on his bed or chew on his favorite rawhide bone. He has not quite figured out what toys are but he is slowly learning from his foster sister. Tommy is content in his crate, but due to his love for being around people he prefers to be close to you. Tommy has learned to use the stairs but sometimes hesitates at going down and needs reassurance. 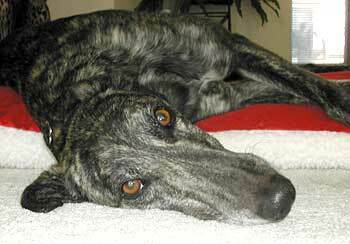 Tommy is a typical greyhound in that he does not bark or howl. He loves to take rides in the car and go on leisurely walks; however he is just as content to be at your feet watching TV. Tommy's housetraining has progressed very well and now signals when he needs to go out by looking down the stairs. At bedtime Tommy sleeps comfortably beside the bed but occasionally awakens to fluff his bed. Tommy has shown no fear of children and seems to be content around other dogs. Tommy's favorite thing to do is to lean on you and he melts when you scratch his neck. 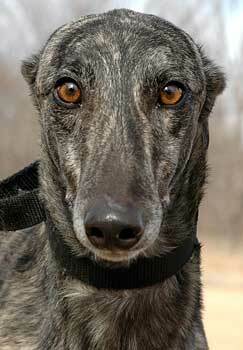 Tommy will make a greyt addition to his forever loving home.